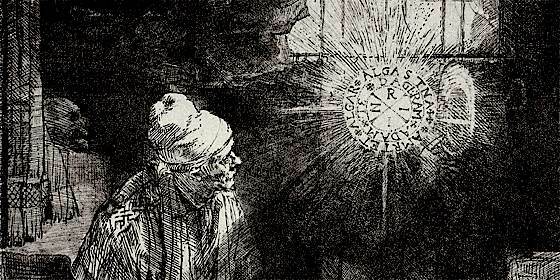 The picture above shows a section of Rembrandt's etch of “The Practicing Alchemist”. Later it was called “Faust in his Study”. What could the code in the mysterious light mean? INRI represents the new tetragram of evolution, of the spiritualization of matter. The old tetragram JHVH (Jehovah) represents involution, the road from the spirit to matter. With Christ, a new principle begins to apply: the transformation of matter, of the human body into the body of resurrection. ADAM TE DAGERAM is an anagram of ADAM ET MERADAG. 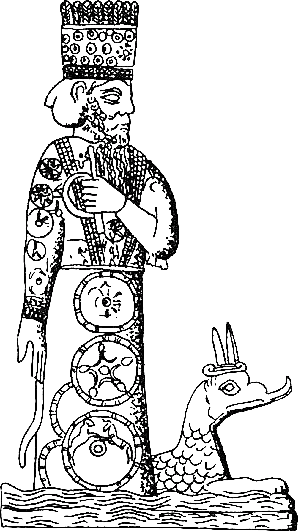 A Babylonian cylinder (Smith's Chaldean Account of Genesis) shows MERODACH delivering the MOON-GOD from the evil spirits. After a long struggle Tiamat was conquered, as we read in the fourth tablet of the creation-story, by the Sun-god, Belus or Bel-Merodach. The struggle, however, is not finished, for the demon of evil is living still and Bel has to fight the seven wicked storm-demons who darken the moon. He kills dragons and evil spirits, and the reappearance of divine intelligence in rational creatures is symbolised in the myth that Bel commanded one of the gods to cut off his, i. e. Bel's head, in order to mix the blood with the earth for the procreation of animals which should be able to endure the light. Note that after the initial struggle, the moon is still darkened and the fight has to be repeated seven times. AMRTET ALGAR ALGASTNA is deciphered by Wormgoor as an anagram for TETRAGRAM GRAAL SATAN (God, Grail, Satan). This suggests an interpretation that man, in the process of the purification of his soul (the Grail-work), is on his way from darkness to light. The word ALGAR is an anagram of GRAAL and needs to be interpreted like a rebus – the Sun - RE is welded like a prefix with the word ALGAR to give REALGAR, natural sulphur of arsenic, born of fire of the mines which is of red color. Lastly, arsenic comes from the word “arsen” which is to say male. One cannot find a more clear definition and more complete symbol of the Prima Materia. Now, when you open a book about Alchemy,there are no more of the enigmas that you will have to decipher. You will do like Oedipus, you will take part in the work. The inviolability of the secrets was assured up to today. But today, being in possession of the solution, you will think that maybe the answer was not difficult to guess after all! To finish with the Realgar which was considered a vile stone, of null value, rejected even like poison, born from fire, red, male, it is the principal matter which enters philosophical sulphur. To know the composition of Sulphur, it is necessary to know how to distinguish the affinities of the various metals used to make the Great Work. For that, let us make a sorting of metals and associate them by affinity, because sulphur is Adam and thus made up of materials of the same color. Fermented in the bath of Marie the Jew (bain marie). 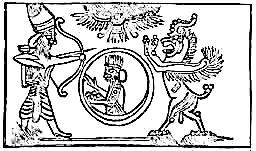 Marduk with bow and arrows, lightning, winds, a hurricane and special net, went forth to meet Tiamat in his chariot. They met and Marduk caught Tiamat in his net. Tiamat opened her mouth to swallow him but he let loose the hurricane which filled her belly. Stunned, Marduk shot an arrow into her belly and killed her. Her army fled in confusion but Marduk captured them in his net and cast them into the underworld. While cutting up Tiamat, Marduk devised a plan. He used her body and made the earth and the dome of the heavens. He made the nest of the gods, the stars, set the length of the year, and ordered the movement of heavenly bodies. Man was then created with the blood of Kingu, the general of Tiamat’s army. 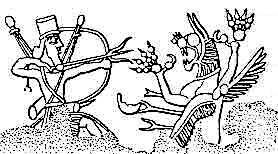 Marduk made rivers, vegetation, and animals, which ended creation. As a gift to Marduk, all of the gods gave him their titles making him the God of Gods. NABUL/NEBO The prophet. This god was the son of Marduk associated with prophecy received by singing, chanting and muttering (in “other tongues”) as well as oracles. He was the original of both Apollo (Nabul) and Hermes as the Greeks knew them. 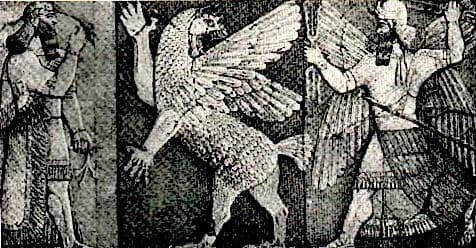 The names Nabul and Bel were the official names of Nimrod/Marduk in later periods and were popular in these later periods among the ruling classes of Babylon as name elements such as NEBUchadnezzar and BELshazzar.